A comforting and homemade chicken noodle soup. 1. Pour the chicken stock and water into a large pot. 2. Place it over high heat and bring to a boil. 3. After 2 to 3 minutes, add the chicken and lemongrass. 4. Bring to a boil again. 5. Reduce flame to medium and simmer for 30 to 45 minutes. 6. Grind together the garlic, ginger and galangal to a smooth paste. 7. Heat little oil in a pan over high flame. 8. Saute the ground paste for a minute or till it starts to turn golden. 9. Switch off the flame and add the turmeric powder. 11. Remove and transfer the chicken and lemongrass to a plate. 12. Add the garlic-ginger paste, coriander powder and salt. 13. Stir well until the paste is thoroughly mixed. 14. Allow it to simmer. 15. Meanwhile, remove the meat off the chicken bones and finely shred them. 16. Add the shredded chicken meat to the soup and bring the soup to a boil. 17. Transfer the noodles into individual serving bowls. 18. Place one hardboiled egg into each bowl and ladle the soup over. 19. Garnish with the coriander leaves and spring onions. 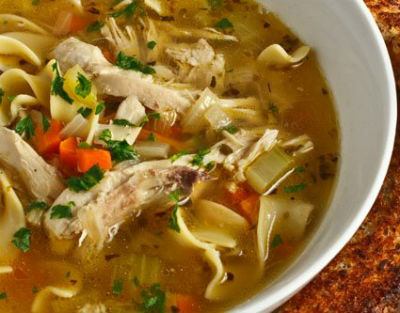 Feel free to comment or share your thoughts on this Chicken Noodle Soup Recipe from Awesome Cuisine.